Amazon WorkMail vs Microsoft Exchange. What is the best Business Email software? Microsoft Exchange Server is the server side of a client–server, collaborative application product developed by Microsoft. Exchange's major features consist of electronic mail, calendaring, contacts and tasks; support for mobile and web-based access to information; and support for data storage. 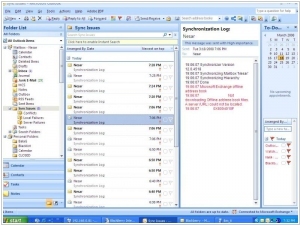 Microsoft Exchange free open-source alternatives are Open-Xchange, Zimbra, SOGo, Zarafa. Amazon is adding one more service to its business-suite arsenal - WorkMail - the company’s new email and calendar service, that will compete against Microsoft Office 365, Exchnage and GMail. Amazon believes that customers “feel those solutions are expensive and complex” and it’s betting its service is easier to use. 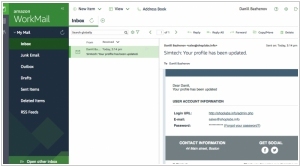 Customers will be able to still use the same email applications as before like Microsoft Outlook so the look of the product won’t be different from what they are used to. Under the covers, however, will be Amazon technology that takes over the duties of sending and retrieving email. Amazon also said that its new service supports encryption and the ability to store emails in specific geographic regions. As for pricing, it will cost companies $4 a month per each user inbox.